Entire Area: Cape Town UTA B - Class C - FL195/FL145. South of Saron: Cape Town TMA E - Class C - FL145/FL085. West of R365/R44: Langebaan Military - FAR45A - FL195/FL1500AGL. South Western Cape Aeronautical Chart as Published by the Chief Directorate, South Western Cape Second Edition 2000, Aeronautical Edition September 2009. Langebaanweg clearance is required to fly most sites in the area. Stay below FL085 when flying south of Saron. This is "friendly" interpreration is a rough guideline only. The Chief Directorate via South African CIVL Aviation Authority is the only source. 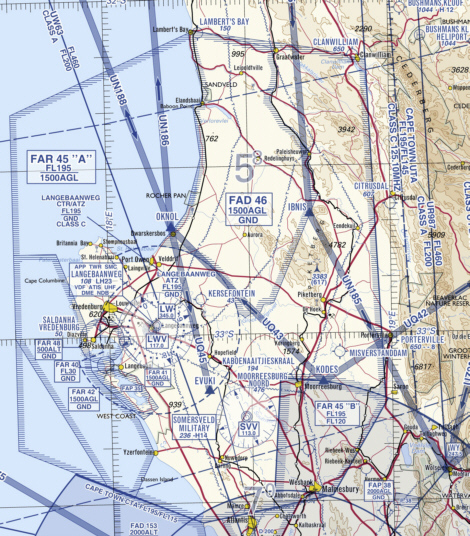 If you are unsure then get an airspace map or ask.